Ok. So, maybe Birchbox didn’t save my life but creator and founder of Birchbox, Katia did. Katia and I were introduced through who know’s what, I honestly couldn’t even tell you how, my life has been such a whirlwind. 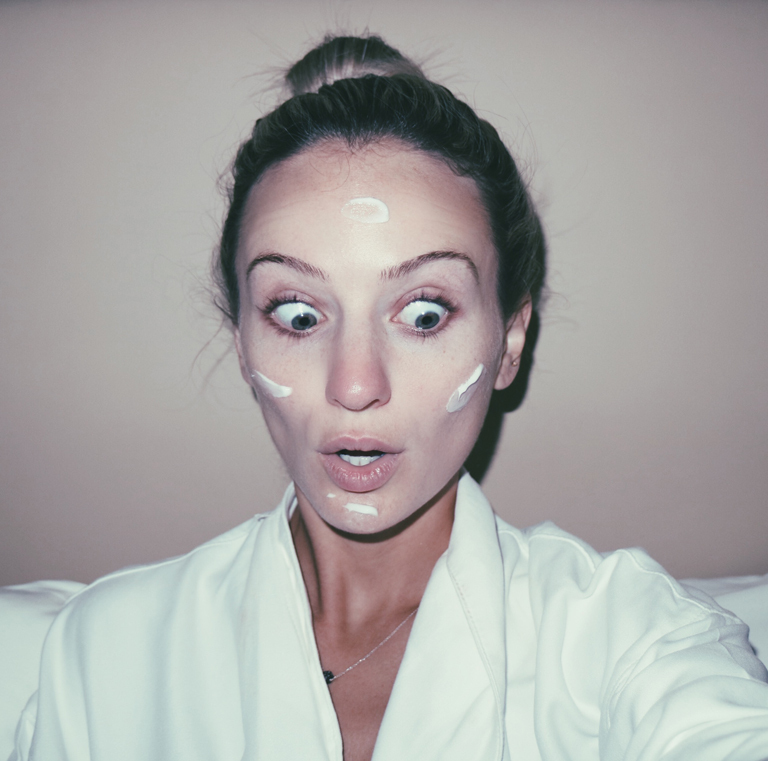 I had the pleasure of getting to know this girl boss and her take on skincare and it really has changed my entire routine. Katia reminded me that I am getting older and need to take care of my skin. Her and I both agree that preventing aging is much better than fixing those wrinkles once they form. I also have incredibly dry skin and living in Denver, traveling, and not drinking enough water were not helping. Katia shared with me her routine and favorite products and now, after using all these products for about a month, I can truly say my skin has been saved. Wash face with Shiseido Cleansing oil. This is my number one recommendation for all of you, no matter what skin type you have. I was constantly stripping my skin of its natural oils using harsh face washes that left my skin feeling chapped and dry but “clean”. I thought my skin was only clean until I could barely make a face and looked like I had just received 45 units of botox. This is simply not true. Your skin needs oils. Oils fight wrinkles. This miracle worker literally melts away ANY amount of makeup in a flash and has changed my skin entirely. I’m not kidding you guys, I know it looks aggressive but it has totally transformed my skin. While I used to see washing my face as an annoying task that I would constantly be too tired to do, I now actually enjoy getting ready for bed. Rather than seeing it as a task or chore I now see it as pampering myself and caring for my beautiful, glowing skin. See all my favorite products below. Also check out Birchbox if you have’t already. It’s like Christmas once a month. Just wondering. But do you apply the eye serum face serum on top of the face moisturizer, eye cream and toner every time you wash your face? Like do you always use all those steps at once?! BTW I’m obsessed with your blog already! You are amazing!!! Love! Asian beauty products are the way to go! They keep you looking young and have many quality brands at an affordable price. Thanks for sharing! Lauren, I have been watching you since the Bachekor and now your new series Happy Ever After. Tonight I learned about your new blog and I’m truly excited for you. It’s got a lot of great tips and fun stuff about your life and journeys. I’d love to share the amazing beauty prioducts made by SeneGence with you. It has the premier LipSense which is long lasting lip color that doesn’t snear or kiss off. Christina Aguilera along with Jennifer Aniston are just a few that love it. Also we have other makeup as well as the most amazing anti-aging skincare unlike any others. I’d love to send you some and let you see for yourself just how remarkable it is. Then share with all your family and friends. I know you won’t be disappointed. Even better it’s 100% guaranteed and bottom of the bottle guaranteed. I’d love to hear from you. I actually just received my first Birchbox today! Can’t wait to try out my new products…but will definitely be trying your skin care routine. Thank you! I will definitely take your word on this, Lauren! I have been looking for a skin care routine that works and I’m so happy you put in the time to be so detailed! Love you! Rodan +Fields skincare is an awesome line of anti aging skincare! R+F was greeted by the famous dermatologists that created Proactive. They are doing the same for anti aging they did for acne! I would love to introduce you to Rodan+Fields! We are launching LASH BOOST today for lashes and brows!! Thank you for your routine. My daughter has rosecea and the oils are necessary for that type of skin. We’ll check to see if these products can work for her. She is excited. Thanks for your blog. Talk to your doctor or dermatologist about tinea versicolor. I had white spots that would come and go and get especially worse in the summer months. Its essentially an imbalance of yeast in your skin but usually isn’t harmful. While the spots initially made me self conscious, I have decided not to treat mine (fairly simple treatment options) and just embrace it! enjoyed following your love story and I am so happy you have created this blog to share with so many. I have a quick question for my brow and yoga routine😉… Do you recommend the same color you use for us brunettes? Yayayaya, I am seriously so happy about this!! I’ve already written down all of your beauty regimens and can’t wait to test em out! Come on over to Boise, ID and shop with me 😀 Love your face! Great post! Can’t wait to try these products. I’m 32 and need to start this now!!! I just started using cleansing oil a few weeks ago and I love it, too! I use H is for Love brand (handmade in Spokane)! How wonderfully amazing your blog is let alone this post in its own glory is simply perfect. Thank you for sharing how you get your skin to look so flawless. I am loving this blog so much! R+F is available in Canada too!!! Thanks for sharing! 🙂 I have a few questions… Do you rinse your face with water after applying each one of these products? Also, what do products do you use in the morning? Thanks for the tips Lolo!! These products sound great! I just subscribed to receive a monthly Birchbox, and try it out for myself. Thank you for sharing with us! Your skin is flawless! Love these tips. Thank you so much for the information, I have been waiting for a great skincare routine! Do you have any recommendations for similar products that may not be as expensive? I’m so glad you posted this because your skin always looks so flawless! I love reading about others’ skincare routines and I will definitely be trying out a few things you mentioned! Such a great blog! So proud of you Lauren. Thanks for sharing! I definitely want to check out that oil cleanser! Any product recommendations of eliminating black heads?? Thanks! I am obsessed with skincare products. I love trying new things! All the products you use sound great! Have you tried vegan products? I have been going CALM skincare for moisturizers and Juice Beauty has a natural line of make-up and skincare products. All vegan and natural ingredients. I was just curious what face wash you use in the mornings? Super helpful post! I also have super dry skin and am guilty of scrubbing my face until it’s dryer than the Mojave. If you could only afford 2-3 of these, which would you consider the must-haves? I’ve always wanted to try cleansing oil, but was worried it would be greasy… Going to have to give this a try! Do you do anything in the morning as well? Or just wake up and go? Yes, Birchbox! I ordered this in September 2016 for my daughter and love the products. Im going to try the cleansing oil idea. For those that cant afford a $32 one, Neutrogena makes a $9 cleansing oil at Target. I tried Olay nightcreams &they were so thick on my face & it felt so oily in the morning. Havent found a good serum or nightcream yet. Love your blog Lauren. Totally unrelated to makeup…but what do you use/how do your do your hair? I have wavy hair and am in some serious need of hair tips. I have wavy hair too! I actually tried a Brazilian blow out to tame some frizz and it helped a lot. I’ll also share my favorite hair products. Tutorial to smooth frizzy hair and achieve a nice wave! Hi Lauren! Can you please post this tutorial when you have time? Including hair products and hot tools that you use. LOVE your hair always. SO excited you have a blog and can share tips on beauty and style ! I love your style and your skin and make up is always flawless! Your so cool and beautiful ! Can’t wait to see more !!! Love you ! Hi Lauren, what Laneige serum are you using? I found 3 different ones. Can you please clarify. Thank you so much! Do you have a different skin ritual for morning and night? If so, I’d love to get an example of what you do for your morning skin care! Thanks for the recommendations! In your post you mentioned Laniege face serum – but below you posted the link for that being Laniege water bank eye gel. Did you mean to link that one or did you mean to link the Laniege Water Bank Moisture Cream? Was confused since already had an eye cream, and it didn’t make sense to use the eye gel as all over face serum on face and neck. Thanks for the clarification! Hi Lauren , just a suggestion , you may want to read up on EWG.org about these products you are using. They are not safe. Are you familiar with endocrine disrupters? EWG has a healthy living app that is very easy to use . If you want to try safe products I can help you. Make a video!!! That would be awesome and blow up !! Do you always use two creams and do you use it at the same time ? Lauren you are beautiful! Love your blog! I am always obsessed with how your makeup looks! You should do a video makeup tutorial that also shows what kind of products you use! Thanks for all the amazing tips! Does this routine help with acne? I have been breaking out like crazy latley around my chin! What is your morning skin care routine? Thank you for the tips, I already bought a lot of these! What face cream do you use before your makeup? Twice a week in the morning! It wakes up my skin and exfoliates without drying! I have super sensitive skin. I’ve tried to use cleansers, moisturizers, and age-preventing products before, but every time I do, my face breaks out. My acne medicine (Acanya) dries my skin out so much, and I’m now 21 years old, so I feel like I need to start saving my skin. I also have been laying out in the sun without sunscreen all my life, so I know that won’t be good for wrinkles in the future. So, I don’t know what to do! Do you have sensitive skin? If not, do you know any products that won’t make me break out? Thanks so much, Lauren! I love you and Ben so much! Hope life is going great for you guys. I do have sensitive skin. I feel like your skin would benefit from the cleanser. It’s so gentle and doesn’t dry out my skin! Also- to prevent wrinkles on the most sensitive part on your face, your eyes, start using an eye cream ASAP! Hey Lauren! I am a Bachelorette fanatic and I think you and Ben are just the cutest! I am in love with Rodan + Fields. Have you ever gotten your hands on R+F products? #1 in anti-aging! The celebs love it. It’s featured all over the media! You’d be obsessed! We carry a Multi-Function Eye Cream too! I’m starting small on this because the $$ adds up quickly, but I want to say I got the cleanser and the laniege face moisturizer to start, and WOW! I’ve never woken up with my skin feeling so soft and moisturizer do. My aesthetician will thank you, Lauren! Great recommendations! Can’t wait to see what else you have for us! Thank you so much for this post. I had never developed a habit of a night time ritual. I decided to give yours a try, I started with the Shiseido cleansing oil and the Laneige Face Moisturizer. I can’t quite afford the other 3 products at the the same time, which out of the 3 (Shiseido eye serum, Laniege face serum, Claudelie eye cream) would you recommend as the most beneficial? I’m 25 with normal skin type! Thanks again and I can’t wait to see what else you have to share with us! Those are great products, but I’m curious If you’ve heard of or tried Rodan + Fields. If not I’d def love to get you a sample and see what you think! We even have a line specifically for sensative skin! It is now the #1 premium antiaging skincare line in the US, and the #1 premium acne skincare line in the US also. #2 premium skincare line over all just behind Clinique (but not for long 😉 ) I love reading your blog and can’t wait to see more and try some of your tips! Hi there, You’ve done an incredible job. I will certainly digg it and personally recommend to my friends. I am sure they will be benefited from this site. Loved watching you on the Bachelor with Ben. You were a class act. Y’all seem perfect together. Someone did mention above about EWG and checking how safe products are. I am a consultant with BeautyCounter. We carry safe but very effective cosmetics and products. Their skincare…can’t say enough amazing things about it. I would be happy to send you samples to try if you are interested. This is a awesome face routine. Can’t wait to see the brow tutorial!! How often do you use the face mask? Hey Lauren! You mention a Tata Harper toner that you spray, but I don’t see a picture of it linked in the article. Which one specifically is it? Thank you! Create a free account to check out faster, store multiple shipping addresses, view and track your orders in your account, and much more. Join Birchbox to receive monthly deliveries of personalized beauty samples, or shop Birchbox exclusive product samplers and kits. Excellent site you’ve got here.. It’s hard to find high-quality writing like yours nowadays. I would never understand. It seems like too complex and extremely broad to me. I am just looking forward for your forthcoming post, I’ll try to obtain the hang of this! I’ve been browsing online greater than 4 hours today, yet I never found any interesting article like yours. all web owners and bloggers made good content while you did, the internet will be considerably more useful than previously. the images on this blog loading? I’m trying to determine if its a problem on my end or if it’s the blog. I’m 22 and am trying to get a head start on my skin care routine. However, at my age, money is a slight issue? Which of these products which you say are more important than others since getting them all is a little pricey for me? Also, would you say the Tata Harper toner is worth the price? Thanks so much! Can you post about your everyday face makeup? Your skin always looks so flawless but natural so I want to know your make up routine! Hi Lauren! I know how much you love your skincare! But have you ever heard of Nerium?! It is seriously the best ever and it’s a one and done product. All you need is the night cream, day cream and eye serum and you are set. It tackles all of the issues we have with our skin all in one bottle(night cream). My skin has never felt or looked better and I have had some of the same issues as you shared. Love to share more if you ever have an interest! The products are all botanically based and paraben free as well! It’s would be really cool to get an honest review of the products from you as well! Love your blog and thanks for all you share on here! Curious to know your thoughts on eye lash extensions and if you use them? I have had them a couple times. Not the biggest fan! I just use glue on lashes for special occasions. If you have light lashes and want to add drama i recommend lash tinting. I get my lashes tinted dark brown because mine are so blond! That way I don’t have to wear mascara every day! Your skin is amazing!! GOALS! I just started my birchbox, I like that i can go on and pick a favorite. So now I am wondering your morning routine? I am really needing some input and this has me wanting to try these products, but I always get stuck on what to wash my face with in the morning and which moisturizer to use during the day. What are your favorites? Hey Lauren! I have redness and dryness around my nose, would any of these products be good for me? Rodan +Fields is the best skincare ever! It is the #2 premium skincare in the US. Ithe doctors that developed Proactive for acne has developed Rodan+Fields for anti aging skin. I would love to tell you all about it! Love your blog… you’re doing an amazing job. Keep it up!! I just ordered some of the face products you mentioned to try them out, can’t wait to start…! I’m in desparate need of good face products. Also, tell us about what make up products are your favorites and how you do you hair…! It looks gorgeous!! You are doing a wonderful job on your blog, and for just starting I seriously have to applaud you! However, I have a question that I seriously have struggled finding an answer for so I am coming to you…. I am 30 years old and have the same color hair as you, but my hair is not as thick and definitely not as long (beautiful) as yours – do you have any suggestion on a halo hair extension brand and color? Again, I have an ashy blonde grow out and would love to add some more length and fullness. Would appreciate it if you have the time to respond. Thank you so much! Is Birchbox available to Canadians? Lauren, you mention this is your nightly skincare routine. What is your morning skincare routine? Thank you so much for this post. I totally revamped my skincare routine with most of these products and I feel like it’s really making a difference. I was wondering about the Tata Harper Toner though. When you click the link in the post it goes straight to a reparative moisturizer. Was this the correct link? Again, thank you so much for all your tips! And I truly hope you do ignore all those jealous haters on Instagram. I don’t know you but you appear to be a very beautiful and healthy person. Looking forward to a hair tutorial video next! Hi Lauren! I was wondering if the Eminence red currant balancing concentrate worked on clearing up your breakouts? Designer, fashion enthusiast, dog lover, sister, daughter, beauty obsessed, travel junkie, Believer. Just a girl who wants to spread a little kindness in this world.